What are your thoughts about the Apocalypse of Gabriel? I'm just wondering what to think of it. I am tending to be skeptical mainly because I haven't seen photos of the text or stone yet to be able to see the problem areas of the text for myself. I also wonder how sure other scholars are that the text is authentic (not forged or tampered with) and really from the first century BCE. Jim Davila is keeping track of the media attention HERE. I am very cautious because of what has happened with the James ossuary and the Gospel of Judas. The ossuary is highly suspect as a forgery and the Gospel of Judas was so badly misread. I think that we need to approach this newest discovery with caution, and sort things out. One of the things that keeps nagging at me is the fact that the early Christians had to explain again and again that the messiah was meant to suffer and die, to Jews who thought otherwise. If the Apocalypse of Gabriel is authentic, then its messianic ideology must not have been very well known among the Jews. Anyway, I'd like to collect some initial reactions and thoughts about the Apocalypse of Gabriel. My initial reaction is similar to yours in that I would like to see it before making any worthwhile judgments. I believe that it is being presented in a fantastical manner, and this is dangerous in that a critical examination of the stone may never reach the masses. An interesting development, but one that I think should make us very cautious about over-reacting. This kind of discovery can lead to all sorts of over-heated speculation, but I do have a couple observations. First, I really don't see how a text like this would change the minds of many Christians. 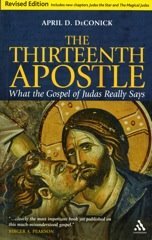 The fact that resurrection language isn't unique to Christianity is simply unsurprising. I'm reading N.T. Wright's book on the resurrection, so it is ironic that this has come out, given that he argues vigourously that the idea of bodily resurrection is a Jewish idea, albeit more easily traceable in the 2nd Temple Period. Whether you take this argument seriously or not, Wright shows the desire of many Christians to connect to a Jewish background to Christianity. So, this really seems anti-climactic to me. Second, we know next to nothing about this text. We haven't seen the text in detail, so speculation is rather futile. Third, I really am sceptical about the fact that this is ink written on stone. I agree that ink was used in inscription and could have survived, but the likelihood is quite low, so I'm not sure how much I'm willing to invest in this discovery until it is explain how it survived in a legible state. Given the sometimes dodgy scholarship around other such discoveries which makes such great claims in recent years, I think you can understand my hesitation. On the whole, I'd like to see more details, but I'm sceptical on a lot of scores. For me, one of the keys is this objects uniqueness. This is the first time I have heard of texts like this being done one stone with ink. So was this a common practice or is this the only such example? The use of ink on stone is definately odd, although I'm not sure it is unheard of. Certainly, much of our ancient graffiti is paint on various surfaces. Yet, preservation is one of the major issues here because ink and paint would fade. In the case of ancient graffiti, survival tends to happen under unusual conditions. Here I've seen nothing about where this tablet was found. Has anyone else seen this? A second point which didn't occur to me last night. Isn't it a little unusual to find a literary/religious text recorded on stone? There are precedents, of course, but I would expect this kind of text to appear on papyrus or paper substitute. Again, not impossible, just odd. 1. Has anyone taken a sample of the ink to see if it matches ink used in the period? Of course this can be faked. 2. I saw no references to the script used in writing the text. Has any expert looked at the script to determine a date? Again this can be faked. 3. I saw no references to the grammar and words used in the text that might be used to date the text. Again, this can be faked. 4. Has anyone taken a piece of the stone to try and determine the source of the stone? 5. I also don't see any reference to how the stone turned up. Was it in a private collection? Did someone go to an antiquities dealer and sell the stone? (This shouldn't rule it out right away as most of the Dead Sea Scroll were found that way) Did the finder identify the place where s/he found the stone? Seems to me until the archeological questions are answered that we have say we don't know enough about it to say anything except that we have words in ink on a stone and we don't know when it was written or where it came from. Why present a paper on an item that has no evidence that it is ancient? Just so ya'll know, BAR today says they have an article coming later in the year about the stone by Knoll and published an article by Ada Yardeni. She says the paleography is correct for the period. My other questions still apply and I have another. If the stone was outside the ink would have faded. If inside it should have patina. The science would help to convince me of the age. "Many museum collections today contain altars or squared-off panels which seem to have been made ready for an inscription; but the text was never inscribed. Sometimes these can be seen as spare merchandise in a stone-cutter's yard that was never used, or proved faulty, and was later utilized as building material. At other times we can suspect that the letters themselves were simply plainted on to the face of the stone, and not cut with a chisel. Obviously this was cheaper than having the letters cut; this method had a reasonable lifespan so long as the stone was not left exposed to the elements. A link could be assumed between the standard of lettering and the amount of money the customer was prepared to spend." the real issue here is not if the artifact is legit, but rather the issue of what is stated within. The consensus is that the modern day jewish thought says that they did not believe that the messiah would suffer and die, shed his blood, and rise again for their sins. And that there is nothing valid to suggest that jews at that time believed it was so. But that is completely erronious. Plenty of rabbiis at that time believed the scriptures(old testament)and taught it, just not the majority. Also, we have today what we had back then, Isaiah 53, exodus account of the passover etc. that clearly suggested that the messiah would not only suffer and die and shed his blood and rise from the dead for the sins of the nation, and also the world, but would also be God in the flesh(Isaiah 9:6)(7:14) This is all established by the recent discoveries of the dead sea scrolls in the 1940's, in that it preserved the whole book of Isaiah verbatum to the book we have today. And that archaeological discovery was definately legit. So again, whether this latest find is legit or not, is no excuse for our unbelief of what God has told us from the very beginning in his Word. My prayer for Israel is that they would be saved, which can only come through there receiving of the true Messiah Jesus who suffered and died and shed his blood and conquered death and hell on the cross at calvary for there atonement and ours as well.